Looking for a Complete ID Card System? Our photo ID systems include everything that you need to start printing your cards within minutes. Each system includes an ID card Printer, ID card software, a camera, PVC cards and a ribbon. The ZXP Series 7 printer has an innovative design. It automatically adjusts to the thickness of the card, and ribbon loading is easy. With color coded guides and a clear LCD control panel, it�s simple for anyone to use. 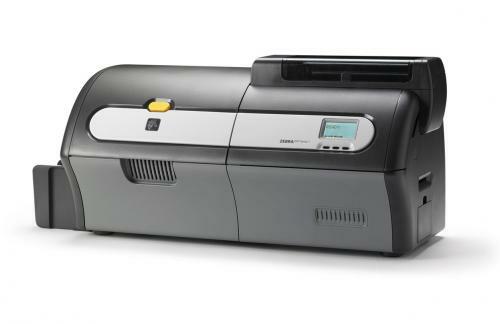 Designed to work right out of the box, the ZXP Series 7 printer offers high speed and low maintenance. For example, up to 3 jobs can be processing at the same time (encoding, printing, and laminating simultaneously) for faster throughput. And the ZXP Series 7 printer uses high-capacity media, and ribbon and laminate rolls are synchronized. With the Zebra ZXP Series 7 printer, you will get near-photographic print quality for all your cards. The Zebra ZXP Series 7 comes with a two-year warranty. The Zebra ZXP Series 7 single-sided ID card printer is ideal to print high-quality cards in high volume. Time after time, it prints sharp, vivid cards with precise color control. NOTE: Printing throughput (cards per hour) based on batch printing with USB connectivity. Times may vary depending on the computer configuration. NOTE: Please see www.zebra.com for up to-date listing of supported systems. The Zebra ZXP Series 7 Single Sided ID Card Printer features a 2-year warranty on printer and printhead, plus 1 year printer loaner coverage. Very nice printer for the money! If you are looking for high quality and high speed, this is a great printer to consider. Over 500 prints so far with no jams, ribbon breaks, or any other issues. Thanks to the sales staff at IDSECURITYONLINE for the solid recommendation! 185 1 Very nice printer for the money! If you are looking for high quality and high speed, this is a great printer to consider. Over 500 prints so far with no jams, ribbon breaks, or any other issues. Thanks to the sales staff at IDSECURITYONLINE for the solid recommendation!